What’s the most meaningful thing a district can do to support innovation in its schools? When my colleagues and I at Education Elements work with schools and districts, our approach to innovation and change involves a framework of 25 key factors, all of which are important. 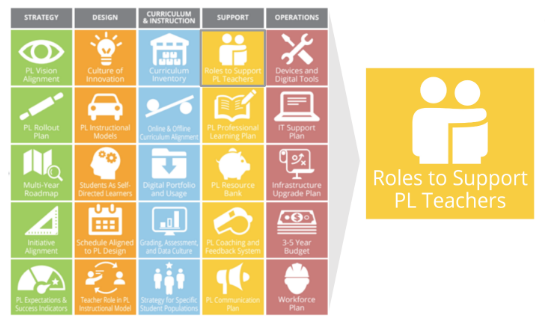 In the past year, though, we’ve been thinking a great deal about one of these – “roles to support teachers” – and the tremendous impact it has on innovation. Specifically, we’ve come to believe that there is a certain kind of innovative leadership, a set of skills and a way of thinking about innovation, that can enable district leaders, instructional coaches, school leaders, and teacher-leaders to have a transformative impact on their schools through the way they support teachers. We believe that one of the single most impactful efforts a district can undertake is to help their district leaders, school leaders, instructional coaches, and teacher-leaders learn to practice this kind of innovative leadership. Innovative leaders are culture-shapers and curiosity-kindlers, they are network-connectors and trust-builders. They are not necessarily the people with the best ideas, but rather the people who nurture, spark, encourage, and celebrate creative and courageous thinking by teachers. In some ways educational innovation is a set of concentric circles: in the innermost circle, students are at the center of a dynamic and thriving classroom led by their teacher. The rings of support that encircle that classroom, maintained and bolstered by coaches, principals and assistant principals, and district leaders, create a community and an ecosystem that supports real learning, creative educational practice, and flourishing students. Supporting teachers in this pattern of concentric circles and creating organic and dynamic schools with a bias towards action and a comfort with teacher innovation and risk-taking, requires leaders to bring a new set of practices and mindsets to bear. Education Elements’ Innovative Leadership Development Methodology is designed to build the ability of educational leaders — be they district leads, principals and assistant principals, instructional coaches, or teacher-leaders — to affect transformational change by supporting and energizing classroom-level innovation. Our methodology centers around a set of frameworks whose design draws upon our experience with hundreds of district-level project implementations across the country. 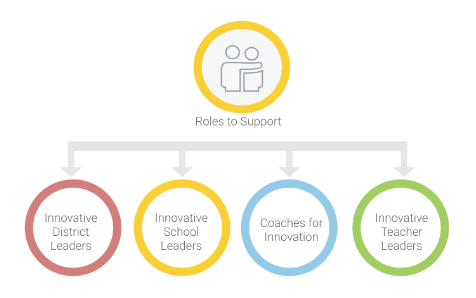 Each framework is comprised of competencies for the respective leadership role – district leader, instructional coach, school leader, and teacher-leader – and designed to support the innovative practices we believe are necessary in each of those roles. Innovative Teacher-Leader Framework: Driven by a strong internal compass, an innovative teacher-leader must be able to disrupt the system to better serve her students, while maintaining awareness of the multiple needs, perspectives, and pressures at play within her school. Innovative Coach Framework: An innovative coach must build meaningful, honest, and deep relationships with teachers and dynamically offer resources and support -- acquired by the coach through her own curiosity, networks, and learning practices -- to help teachers revolutionize their instruction. Innovative School Leader Framework: Innovative principals and assistant principals must nurture trusting relationships with their teachers, maintain a rich network of innovation-minded collaborators, and harbor a predisposition to action and experimentation. Innovative District Leader Framework: Innovative district leaders must communicate clearly and openly about priorities and approaches, celebrate and elevate innovators within their organization, build coalitions in support of new ideas and courageous initiatives, and look for ways to replace bureaucracy and stagnation with agility and action. How might we create positive change in our schools if we started by asking, “What do teachers need in order to transform education, and what can leaders do to support teachers in that work?” We’re hopeful that our competencies can serve as a blueprint for all sorts of districts, schools, and educators interested in more impactful ways of supporting teachers and driving innovation. We hope you’ll join us in this work, using our leadership competencies or creating your own, as a way to shed new light on conversations about educational innovation. Andy Shaw is a Design Principal on the Design & Implementation team, working with district and school teams to improve student outcomes through inclusive and intentional change processes. Andy has worked in education since 2002, first as a high school mathematics teacher and then for seven years as a high school administrator. Most recently, he served as the Dean of Curriculum and Innovation at The Bay School, a progressive high school in San Francisco, where he led a future-focused redesign of the school's curriculum, calendar, and bell schedule. Andy's passion is for process: keeping students, teachers and staff, school values, and culture at the heart of major initiatives. He holds a B.A in Mathematics from Bowdoin College and a Master's of Arts in Education Leadership from Teachers College at Columbia University. Andy is originally from Maryland and currently lives in Berkeley, CA.